Viewing topic "Midi assign in a performance / master mode"
Be grateful for any help in assigning layers or voices in performance mode or master mode so they can be played live by another keyboard. I’ve looked on Yamaha site but can’t seem to follow how I set the transmit/receive channels etc. Great keyboard btw with multiple programmable features. In Performance mode all four of the Parts are on a single MIDI channel. 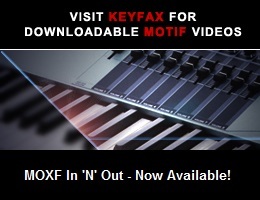 If a Performance is played by an external keyboard the result will be the same as when played by the MOXF’s keyboard - the external keyboard can’t play the Parts separately. Master mode is typically used when the MOXF is the master controller. Based on what you posted, that doesn’t appear to be your intent. It might be that a Song or Pattern Mixing is what you’re looking for. If you explain in a bit more detail what it is you’re wanting to do, we can probably make appropriate suggestions. For example, do you want the MOXF to be able to play certain Voices while the external keyboard plays others? Etc. Thank you for your swift responses they are really helpful and much appreciated. That’s all I was trying to do was to say use a split layer on the MOXF8 (say 2 separate voices) but use a piano or similar voice layer routed to another keyboard via midi to give me the maximum flexibility in playing live. I’m guessing from the reponses that its better to do this in pattern or song mode and its unfrotunately not possible in performance mode? Performance mode won’t allow different Parts (Voices) to be played by the MOXF and the external controller. Then see Mixing Part Edit beginning on page 117 of the MOXF Reference Manual. You could set the Receive Channel to “1” for Parts you want to layer and play with the MOXF. Then set other Parts to a different Receive Channel (such as “2") for those you want to play with the external controller, and set that controller’s MIDI-Out channel to match.